The sort of activities gathered under the label of The Chicago School (of American sociology, not economics) was a drastic departure from the macro-historical and trans-national comparisons of the evolutionary sociology that dominated American academia in the late 19th century. In addition to pioneering the use of ethnographic and case study methods in sociology, The Chicago School also focused heavily on "the city," forging the foundation of urban sociology. Among the many influential contributors to this tradition was Ernest Burgess, a graduate of the University of Chicago (PhD in 1913), and later an Assistant Professor of Sociology at the same institution (in 1916). 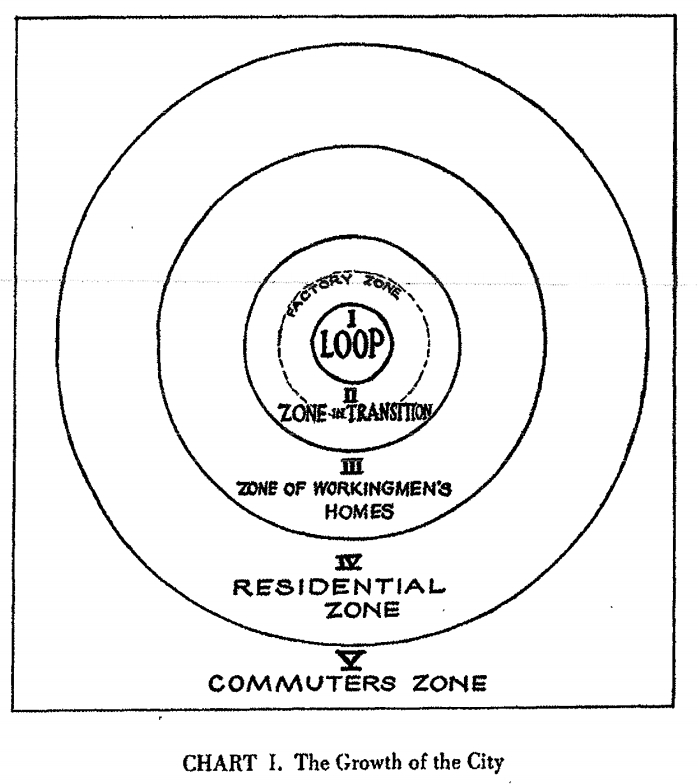 "The typical processes of the expansion of the city can best be illustrated, perhaps, by a series of concentric circles, which may be numbered to designate both the successive zones of urban extension and the types of areas differentiated in the process of expansion...The chart brings out clearly the main fact of expansion, namely, the tendency of each inner zone to extend its area by the invasion of the next outer zone. This aspect of expansion may be calls succession, a process which has been studied in detail in plant ecology." Two extension and succession, Burgess also adds the subprocesses of concentration and decentralization. When described the "natural tendency" (pg 52) for transportation to converge on the center, he invokes the organismic idea of the life-giving properties of the cardiovascular system: "Quite naturally, almost inevitably, the economic, cultural, and political life centers here [in the downtown section]" (pg 52). "Their invasion of the city has the effect of a tidal wave inundating first the immigrant colonies, the ports of first entry, dislodging thousands of inhabitants who overflow into the next zone, and so on and on until the momentum of the wave has spent its force on the last urban zone" (pg 58). However, it is important to note that - just as within an evolutionary framework - disorganization is not necessarily considered bad in Burgess' account. In fact, within this chapter, one can draw out a preliminary account of "disruptive innovation" or "creative destruction," a concept which has become a buzzword in the contemporary technology sector. Finally, Burgess returns to the explicit organism metaphor in the final section: "Mobility as the Pulse of the Community." If instead of a tidal wave of lake water, we imagine the movement of blood, the above "invasion" of immigration can be reinterpreted as blood vigorously pumping through the veins of the city, forcing out old blood. To make this argument, Burgess defines two types of movement: unchanging motion in which one continues to move in a similar, habitual manner, and mobility as a change in movement - a new routine caused by a new stimulus. Mobility, for Burgess, is the more significant for understanding the growth of the city. However, he argues, responding to a new stimulation must involve an integral reaction, as opposed to a segmental reaction. In this later case, the person's reaction is likely to become "disorganizing or pathological" (pg 59). As areas with the greatest mobility are likely to also involve a larger amount of people encountering new stimulations, the probably that these people will be overwhelmed and develop only segmental reactions is greater. By this logic, Burgess concludes that areas with higher mobility will also have higher social disorganization. Therefore, in addition to population change, a second measure of the state of the metabolism of the city is mobility.